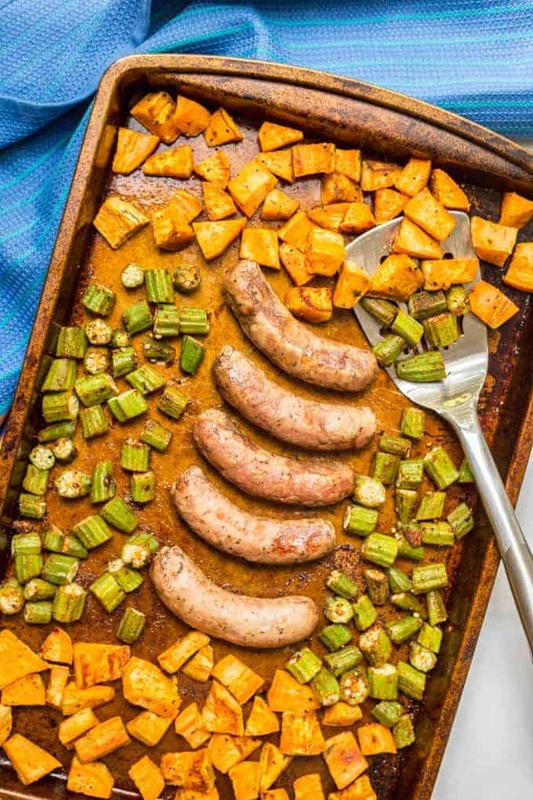 Sheet pan turkey sausages with sweet potatoes and okra is an easy, hands-off dinner that’s perfect for a busy weeknight! So on Monday, I said I wasn’t really looking forward to this week. But it’s turned out to be a really good one! I managed to get myself into a better mindset and sometimes that makes all the difference, you know? We may try and go to a local park festival and we are definitely taking the kids to their first football game on Sunday to see our local Carolina Panthers play. I’m curious to see what they think of it! But speaking of busy weeks, I was excited to hear this month’s Recipe Redux is all about sheet pan dinners! 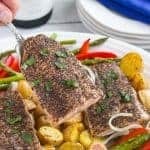 Previously I’ve shared my sheet pan chicken with broccoli and bell peppers (and Parmesan cheese sprinkled over it all) and I’ve made countless others that will eventually make it here to this blog. 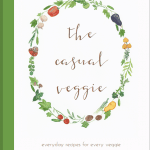 Today I’m sharing my sheet pan turkey sausages and veggies. I use whole turkey sausages (you can choose mild or hot), cubed sweet potatoes and sliced okra. 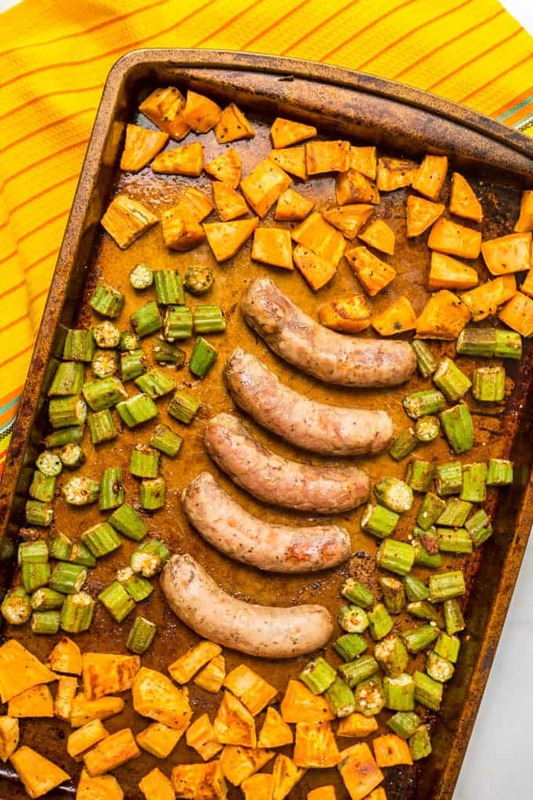 The sausages get browned and plump while the sweet potatoes and okra get a little charred on the outside and perfectly tender on the inside. 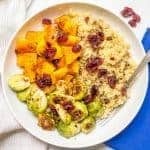 All kinds of warm, cozy, comforting vibes in this dinner! And even the kids loved it! The sausages let off a lot of juice as they roast. I put them on their own separate pan so the vegetables don’t get soggy. I use turkey sausages but you can use regular pork sausage if that’s what you like best. You could also substitute red-skinned or Yukon potatoes for the sweet potatoes. 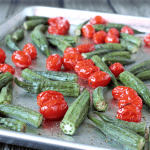 And if you’re not a huge okra fan, switch it out for your favorite roasted veggie. Brussels sprouts would be great here, too! I’ve kept the seasonings very simple but feel free to add your favorite spices to the vegetables. Next time you need an easy, hands-off dinner, I hope you’ll give these sheet pan turkey sausages and veggies a try! 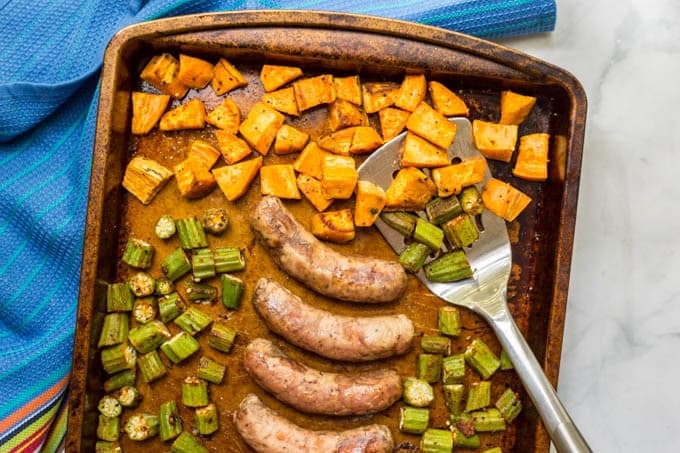 Sheet pan turkey sausages with sweet potatoes and okra is an easy, hands-off dinner! Add whole turkey sausages to one sheet pan. 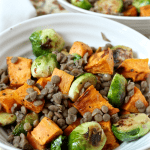 Add diced sweet potatoes to a second sheet pan. Drizzle with two teaspoons olive oil, 3/4 teaspoon salt and 1/2 teaspoon black pepper. Toss to get everything coated and then spread in an even layer. Add both sheet pans to the oven and cook for 20 minutes. After the first 20 minutes, flip the turkey sausages over on their sheet pan and stir the sweet potatoes on the second sheet pan. Add the okra to the sheet pan with the sweet potatoes and return the pans to the oven. Roast for another 20 minutes, or until the turkey sausages are cooked through and the vegetables are tender. I’m thrilled to hear your week turned into a good one! Funny how life works out like that, huh? And it sounds like y’all have a fantastic weekend planned! Go Panthers! I am loving this sheet pan dinner!! I’m all about some sweet ‘taters and I love me some turkey sausages!! And okra!! I haven’t had okra in far too long!! This is totally calling my name, girlfriend! Cheers to a stellar weekend! I love okra and love roasted vegetables, but for some reason it never occurred to me to roast okra! I am definitely trying this. Hope you have a fun weekend with the kids! Yum yum yum!! 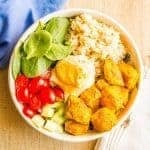 This is such a delicious combination!